The Dolby Theater in Hollywood was full of fans for the show Parks and Recreation last night. The crowd was there to see the cast assembled once again onstage at Paley Fest. The enthusiastic audience went nuts when the crew took the floor for what was billed as a Parks reunion. Amy Poehler, star of the popular show, was so taken by the fans' reaction that she said she was literally holding back tears when she arrived onstage for the reunion. "I'm totally overwhelmed," the obviously moved actress told the excited crowd. The question at the recent Parks and Recreation reunion was simply, When? As in, when will a revival happen. Before the event, Amy Poehler said, "When Michael Schur is tech available." Michael, the creator of the series, has been extremely busy as of late, so that fact seems to be in play when considering any future show moves. "I mean, We need our captain, for sure. I have no idea where I'd want it (the series) to go, we would do what we usually do: blow out the formula, do nothing that works, put us in space. This is why I'm not the one with the ideas"
Amy Poehler said way back at TCA last summer that she was herself "tech available" for a reunion. She also revealed that the cast has stayed close since the show quit filming back in 2015, texting each other frequently. 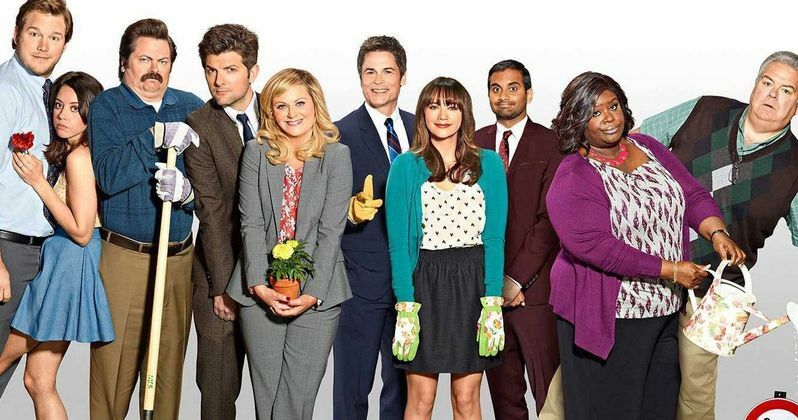 She must have been serious about having a tight knit bond, because last night, despite their massively increased levels of fame (Guardians of the Galaxy and Jurassic World star Chris Pratt, and Sundance star and producer Aubrey Plaza), or previously reported scandal (Aziz Ansari), all showed up for the reunion, as well as Jim O'Heir, Retta, Rob Lowe, Rashida Jones, Nick Offerman, and Adam Scott. Patton Oswalt was moderating the Parks session on the PaleyFest stage, where he suggested in light of HBO greenlighting a new Deadwood reboot in the form a feature film, that maybe their old show could take that route too. "We'd only do it if there was something compelling," said Schur wiping his brow in jest, mentioning that if "anyone onstage said 'No', we wouldn't do (a reunion)." He then showed his own cards in regards to a possible TV reunion, "I would never say never". For Schur, Parks and Rec was about positivity, maintaining innocence in the world amidst cynicism and fully believing in one's own personal power. As to that end he commented, "I don't feel like we left anything on the table, the show made its argument." Aubrey Plaza started speculating where the storyline for April Ludgate would pick up quipping: "I mean, she'd probably have ten children, a houseful of children. Because I know Andy and April aren't going to stop. And they don't use protection. They don't know where to get it. They'll probably have a lot of children. I feel like she's the breadwinner, she's wearing $3,000 suits while Andy makes pancakes." The show ran on NBC for seven seasons turning out 136 episodes. Since the beginning Shur had thought the successful show would be cancelled. "We thought we were getting canceled all the time, I never imagined we'd go for seven years." This news was originally posted on Deadline. NBC's The Good Place and Parks & Rec Share the Same Universe?